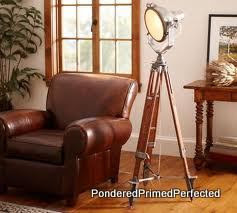 Tripod Lamp ~ Restoration Hardware & Pottery Barn Beware! Have any of you seen the Restoration Hardware Source Book? It has some really provocative home furnishing photos...I highly recommend it. The minute I heard they were coming out with their own furniture line I went to their website and ordered the catalog. This catalog is 600+ pages of vintage inspired, rustic, neutral, dreamy goodness...all shot in a moody, masculine and yet somewhat ethereal fashion. Oh the power of staging, lighting and good photography. I have to admit ~ there aren't too many items in this catalog that I would turn down. I would definitely have to pair them with some light and bright walls, textiles and accessories though. I'm just not totally sold on the dark, somewhat gloomy, altogether masculine look they have going on. "A REPRODUCTION OF A BRITISH SURVEYOR'S TRIPOD , CRAFTED OF WOOD WITH SOLID CAST BRASS ACCENTS." I don't know about you, but that's waaaaaaay out of my budget. Ha. I have not paid $1000 for ANY piece of furniture...not one thing. Then, we found a Spotlight Floor Lamp in Pottery Barn's January catalog, priced at a mere $599. Okay, I know that I'm giving myself away as a cheapskate seriously thrifty person now. You probably already know we like to shop thrift stores, yard sales, junk stores and flea markets. Every so often we head out with a mental list of things we are hoping to come across. I had my chandelier shades on my mental list for months before I finally found 6 matching shades for 99 cents each. Wasn't really confident I would ever find them. That's how I felt about finding a wooden tripod also. So, I just about fainted when Scott casually walked up with a wooden tripod in his hands and said, "Hey, look what I found...". He found an old, wooden, tripod easel with extendable legs for a whopping $3.99 at our local GW store. Sometimes it seems like the stars align in our favor! At this point our fellow GW shoppers were gawking at us...I do believe I might have let out a little squeal. I actually grabbed Scott and hugged him (he didn't complain) and told him how completely fabulous he was. I'm pretty sure he was thinking, "Wow, I guess Sherry really wanted an old, wooden, tripod easel." Sometimes Scott just doesn't share my vision. It's not his fault...he's a visual person...I just needed to show him. It was dismantled in a flash so he could use the parts for our tripod lamp. Once he's got it, he's unstoppable. Alex helping drill the hole for the lamp workings. Scott getting it all put together. It's not as "chunky" or fitted with "solid cast brass" but it definitely has the right vibe about it. The lampshade came from GW also...it was $2.99. It appears brand new...it had a small smudge on it. It isn't quite the right size or shape but it will do until we can get the perfect one. The new lamp fixtures are a rusty brass and the tripod metal is a matte nickel color...also slightly rusty. Hey, I heard it's okay to mix your metals now...if you do it correctly. I wonder if rusty brass and rusty nickel can go together? I might have to put a darker stain finish on the wood to get it looking just the way I want. We decided to live with it for a couple of days to see what we thought would look the best. Should we spray all the metal pieces a uniform metallic finish? What would you do? Turned out pretty nice for a $3.99 lamp, $2.99 shade, approximately $3.00 in miscellaneous hardware, and a $1 junk lamp. What outlandishly expensive item would you recreate if you could? So cool. My hubby show me their site and I was drooling for a whole afternoon looking at all the cool stuff. Your lamp turned out great and sooooo cheap. That makes it even better. WOW!!!! That is gorgeous...as is! I wouldn't change a thing but then what do I know? I think you're right to live with it for awhile. I still can't believe Scott found that at the GW! It IS amazing how the stars align like that. You 2 sure don't let any grass grow under your feet! Wonderful job! You're an inspiration to all of us! Hi Sherry, I love RH but their prices are out of control. The tripod was such a great deal and I love it made into a lamp. I love this! I have always wanted a lamp like this for my house but have been scared away by the high prices. I'm pinning this in hopes that I may find the parts needed to make it someday Please come share at my link party! I am impressed!!! I think it's amazingly fabulous!!! I love it, I would put it in my house if I had found it. Do you ever find that some of your non-decorating friends just look at your house and just don't 'get' you decorating style? I find that all of the time. FABULOUS!!! I love a good knockoff with Goodwill pieces! If you'ld like to link it again, come on over to Tell it to Me Tuesday @ Creatively Living! I can't believe you found that! What a great find! You made it look so high end! I host a party on Fridays and I would love if you'd link up! How lucky are you!!! Great finds. It turned out wonderfully. Jealous! I wanna shop at your GW! And what a great find he scored!! Great job! You and your lamps.... they keep catching my eye ;) I LOVE it and I'm totally jealous! I would paint all of the metal pieces one color. It would really pull it all together. Oh my goodness, your tripod is perfect! What a steal. Your project came out great! i bet someone's wishing they had that tripod back! looks fab! It has to be said..." tttthhhhppppp" I am so jealous ! I want one ! That is pretty darn cool!!! Love it! Wow! What a FABULOUS lamp for a FABULOUS price. Well done! I am going to post a link to this post on my FB page. Thank you for linking it up to Savvy HomeMade Monday! This is a project I've been trying to work on as well! That's why I was drawn to this post. I've found tripods but not the exact one I want, yet. I'm doing black and silver leaf more than likely, with a drum shade. I'm glad to see someone else that did it! I'll refer back to your post when putting it all together. Thanks! This is so cool, I love yours more than Pottery Barn because your's was born of creativity. You really did a great, fan.tab.u.lous job. Ok, now that I said all that can I have it? Pretty Please with sugar on top. I'm so jealous it's in your home instead of mine. Did I mention sharing was a good thing! Thanks for all your creative post you shared with us at Sunday's Best. Super thrifty and industrial! A great combination!! Love this project!! Thanks for linking up to the 1st Project of the Year Party! Totally awesome. I will now be on the look out for an old tripod I can use to create one of my own. Wow, love it! I want to make one of these for my son. Your base is way cooler than mine. It's just been sitting around wanting for me to figure out how to do it. But your idea to use an old lamp is brilliant! Thanks for the inspiration, Susanne. This is so awesome! I am featuring it today! Wow! This is so impressive. I found you post at the Gunny Sack. In all of my thrifting, garage sale hunting days...I do not think I have seen a wooden tripod like this, but I will certainly be on the look out. I have to say that I actually like yours better than the ones in the catalogs. Love how it turned out! What a fabulous find and a great project! Wow...I wish I could find great 'junk' like THAT!!!! Thanks SO much for sharing at the Kiss & Tell party over at my place! Wow Sherry. This is amazing. I have been going back and forth for months now on buying the "real" thing but it doesn't get any better than the one you did so I think I'll follow your lead and try it myself. Thanks for the great post. Now if I can just be as lucky and find a wooden tripod. Hope you are staying dry up north. Our snow is gone down here and we are now dealing with flooding. Luckily it hasn't affected our home but it is scary out there in nearby areas. Stay safe and dry. Oh my goodness what a great find!!! Seriously in love with your lamp. Oh so perfect. This is really an awesome copy. I love it. Well, it is awesome! You're lucky to have such a handy man! It is my first visit here, I found you through Debbiedoos and I am glad that I found you. I have become your newest follower. Have a nice day! I am sooooo coveting this! What an awesome find!! I know how expensive Poverty, uh i mean Pottery Barn can be! This was a major score! Good Job!